Coming Soon in February 2017, Daisy Plant Moisture Probe & App! The Digital Spring patent pending wireless soil moisture probe and accompanying mobile device app which lets you monitor your plants health in real-time. The Daisy Sensor App is an iOS app designed to work with the Daisy soil moisture sensor probe from Digital Spring LLC. This app will take away all your excuses for dead plants. You will always know when to water your plants, whether they have enough light and whether or not they are warm enough or too cold. The moisture probe takes advantage of the new low energy bluetooth hardware built-in to all iPhones since the 4S. Bluetooth low energy allows the probe to send data to the phone for years on a single battery. Meanwhile, wirelessly communicating with the iPhone does not drain the phones batteries. While the Daisy Sensor app is till under development, it will have the following features. Summary view of your plants and their health. Red indicator with number of plants needing attention. Ability to sort the summary by plant health or location. Notification Center, notifications for watering your plants. Whether you need to visit your plant to update the health information. Your custom photo of your plant. The app will try to predict the next watering so you know if you need to water your plants before you go on vacation or whether they can last until you get back. Will show your detailed plant health as communicated by the Daisy light, temperature and soil moisture meter. Scrolling charts of light, temperature and moisture with the ability to zoom in or out to different time periods. Real-time data from the bluetooth probe. Take and crop your own photo of your plant. 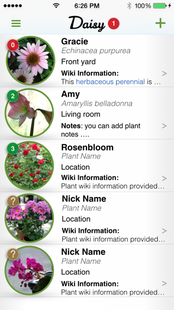 Add a plant location for grouping plants in the same room or area. Sync your plant data across multiple iOS devices with the built in cloud sync. Search and use our plant cloud database for plant health information. Add to our plant database for your region. 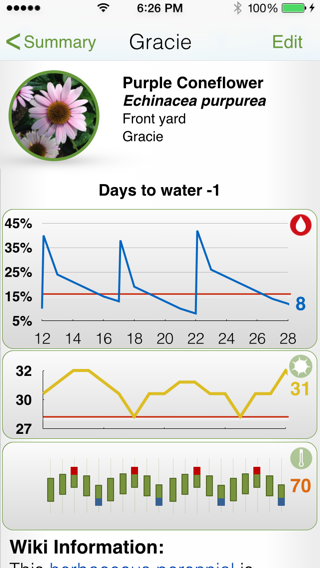 If your are interested in the Daisy soil moisture sensor and app, please check out our Kickstarter page. A brief video of the app development.